This show was postponed to next Tuesday, January 8, at 10:00 pm (Eastern Time). 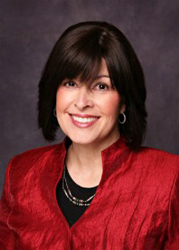 Our guest, this evening at 10:00pm (Eastern Time), will be Allison Josephs, founder and director of Jew in the City. Who is Allison Josephs? Allison has been involved in the field of Jewish Outreach for over a dozen years, teaching and lecturing, working at Partners in Torah, Sinai Retreats, and NCSY. She is, also, the spiritual mentor to actress Mayim Bialik. She was named one of NJOP‘s Top Ten Jewish Influencers in 2012 and has been quoted or written about in numerous publications, including The Wall Street Journal, The Daily Beast, Huffington Post, and Yahoo News. Allison has been interviewed on television and radio, including programs such as “What Not To Wear,” Associate Press TV, and NPR; her articles have appeared in numerous publications including the newly released anthology Like Water on a Rock, The Washington Times, The Jewish Press, and The Forward. She has also written many articles, directed and produced videos for Aish.com and lectures around the country and on WebYeshiva. She received her Bachelor in Arts from Columbia University in Philosophy and lives with her husband and four children minutes from the George Washington Bridge. We will be talking about her recent video as well as future plans for her website and blog. Meanwhile, in case you missed it, please listen to last week’s fascinating discussion with abstract painter Igal Fedida about his life’s journey towards becoming an Orthodox Jew and the connection between his art and Sefer Breshit. Don’t forget to tune us in this evening at Blogtalkradio.com/kosherscene for an interesting talk, with Allison Joseph of Jew in the City at 10:00pm (Eastern Time). We’ll be wait’n for ya! Gavriel Sanders, publicist at ARTSCROLL MESORAH PUBLICATIONS for Susie Fishbein‘s Kosher by Design series – since it started appearing in 2003, will talk to us this evening (at 7:00pm Eastern Time, on BlogTalkRadio.com) about his fascinating life’s path from missionary to proud Orthodox Jew. Other projects he’s handled on behalf of publisher ArtScroll Mesorah Publications include Life Is A Test by Rebbetzin Esther Jungreis, Gateway to Judaism by Rabbi Mordechai Becher, and several books for Rabbi Dr. Abraham Twerski and Rabbi Paysach Krohn. Sanders’ voice is familiar to many Jewish radio listeners in the New York area. Appearing on over 100 commercials, he has also been producer and host of Mah Nishma with Gavriel on FiveTownsRadio.com, IsraelNationalRadio.com, The Jewish Journey on JWisdom.com and of the Gavriel Sanders Show on Zev Brenner‘s Talkline Communications Network. He recently began broadcasting on J-RouteRadio.com. Sanders has lectured coast to coast and internationally on themes of Jewish living, including his popular autobiographical presentation of “A Minister’s Journey to Judaism”. Meanwhile, in case you missed it, here’s the taped show we did with Julia Roth, a mother/teacher/community activist from Richmond, VA, who’s working hard to revitalize and provide missing services to one of America’s oldest Jewish communities. Please don’t forget to tune us in this evening at 7:00pm Eastern Time for a fascinating conversation. We’ll be waitin’ for ya! This coming Wednesday evening at 10:00pm (Eastern Time) we’ll be talking with Julia Roth on our BlogTalkRadio.com show. We’ll discuss a bit of the Jewish Community’s history in Richmond and its evolution to the present time. Mrs. Roth, a mother of 4, attended University of North Carolina where she majored in English Lit; a Chicago native, she currently lives in Richmond, VA.
After spending time with friends in Skokie, IL and seeing how the Chicago Chesed Fund operated neighborhood based food pantries. The idea seemed so simple – neighbors gathering and sharing extra surplus in the community, she thought Richmond could benefit from such an enterprise and presented the project to various members of her circles. The support was astounding as proven by the fact that they opened quickly and have been operating – with a staff of volunteers – for the last 4 weeks with backing from Knesset Beth Israel (Richmond’s largest and oldest Orthodox Congregation). For the last 24 years she’s been a Hebrew school teacher but she’s most passionate about her work as a DONA certified birth assistant or doula – having attended over 100 births. In addition to touching upon Richmond’s Jewish history we will also talk about her activities in the community and some exciting upcoming events. Meanwhile, in case you missed it, please tune in to our conversation with renowned Providence, RI, Chef and food historian Walter Potenza. Please don’t forget to tune us in this coming Wednesday at 10:00 pm (Eastern Time) for an interesting, informative, broadcast with Julia Roth. 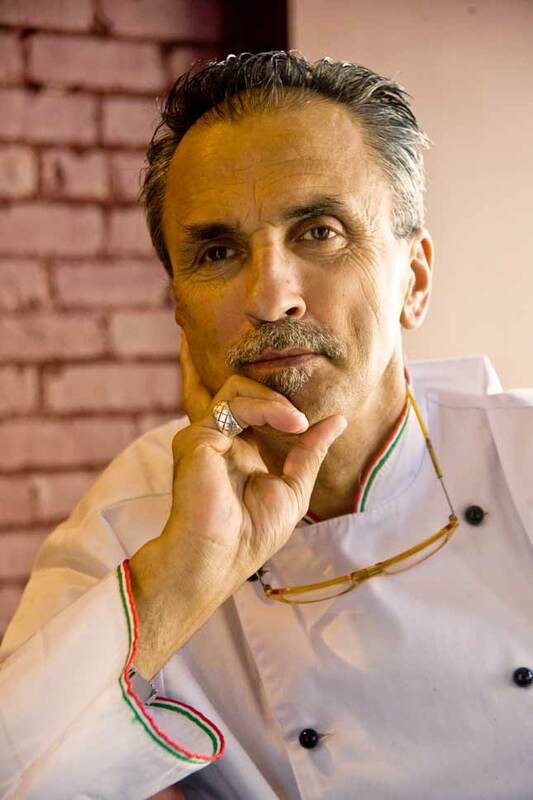 Chef, restaurateur, cooking school director/teacher, food historian Walter Potenza (from Providence, RI’s Potenza Ristorante) will be our guest on tonight’s BlogTalkRadio show at 10:00pm (Eastern Time). We pre-taped this evening’s show, on Sunday morning past, in Providence. Our conversation was truly fascinating; Chef Walter is a warm individual, passionate about food and its history, a true artisan in the kitchen, a superb conversationalist, and a great teacher – in spite of never having graduated from any culinary institution. We spoke about his fascination with Italian Jewish cuisine, with the history of that cuisine, the research involved and the real reason he is so passionate about it. Meanwhile, in case you missed it, please listen to our talk with Shaya Ostrov, On Dating and Marriage. It was an interesting, illuminating show on something that concerns every parent and every single Jewish person out there. Please don’t forget to tune us in later this evening, at 10:00pm (Eastern Time), for a great conversation with Chef, restaurateur, food historian and superb teacher, Walter Potenza. We’ll be wait’n for ya! This evening, on BlogTalkRadio.com/Kosherscene, at 10:00pm Eastern Time (new time!) 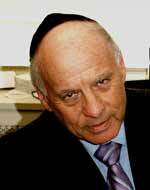 we will be speaking to Shaya Ostrov, L.C.S.W. He is the author of The Menuchah Principle in Marriage, The Menuchah Principle in Shidduchum Dating and Engagement, and The Inner Circle: 7 Gates to Marriage. For more than thirty years, Shaya has been dedicated to guiding married couple and singles toward creating fulfilling and enduring relationships. Meanwhile, in case you missed, please listen to our broadcast with Judy Gruen. She is an award-winning humor columnist, author of four books, and self-described unrepentant chocoholic. Don’t forget to tune us in this evening at at 10:00pm Eastern Time on BlogTalkRadio/Kosherscene, for what promises to be an informative, entertaining, inspiring show. This evening, on our internet radio show we will be talking with Jeffrey Elliot and Salvatore Rizzo, at 8:00pm (Eastern Time). Jeff will be teaching the essential techniques of knife skills necessary for the home cook at De Gustibus this coming Tuesday from 1:00pm to 4:00pm. To sign up for the class, please go to the De Gustibus‘ website. A light Kosher meal will be served. Jeffrey Elliot has a degree from the Culinary Institute of America and has cooked at prestigious restaurants such as Le Cirque, and Le Bernardin in New York. Since leaving the kitchen, he’s owned an antiquarian bookstore, received an MBA and worked as a stockbroker. He has also worked for Share Our Strength, a non-for-profit dedicated to eradicating childhood hunger in America, organizing Taste of the Nation events in 15 cities across the US and Canada. Currently, Jeffrey is the National Manager of Culinary Relations for Zwilling JA Henckels. He is a co-author of The Zwilling J.A. Henckels Complete Book of Knife Skills. 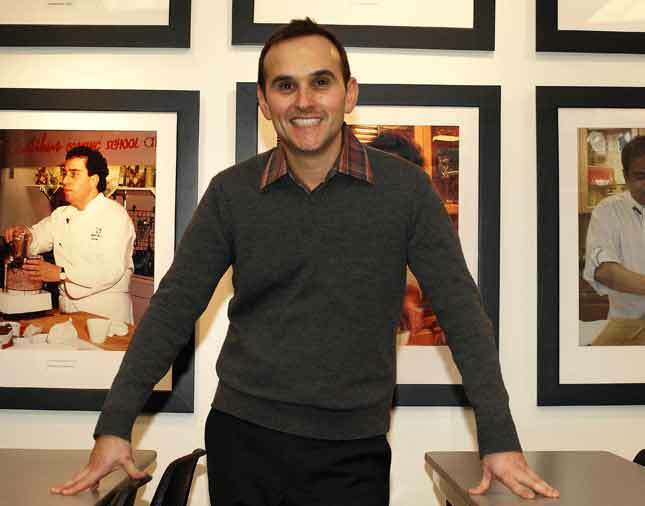 Salvatore Rizzo acquired De Gustibus Cooking School in April 2008. He has been active in the culinary world for over 25 years, honing his skills as the consummate host and interlocutor of chefs. 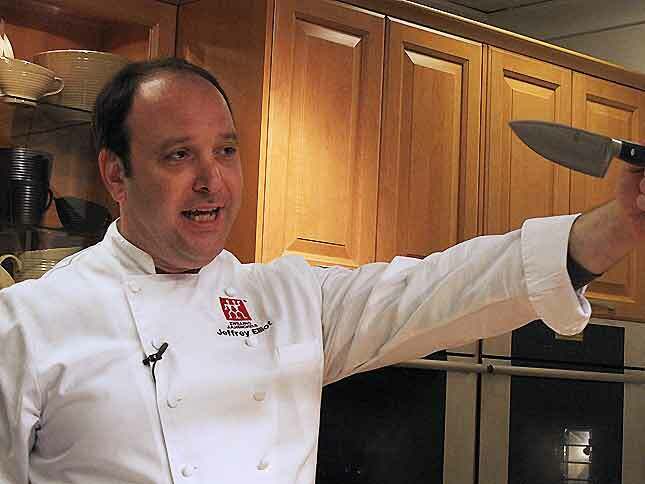 Sal was the Director of the Italian Culinary Institute where he managed chef events for several years, after which he became Director of House Operations and Events at the prestigious James Beard Foundation until 2007. A true master of hospitality and friend to many a chef, Sal’s passion involves promoting the culinary arts and creating an environment where people can come together and share incredible experiences centered around food and wine, something he was exposed to daily, growing up in a Sicilian household. Meanwhile, in case you missed it, why not listen to our last last broadcast? Our guest was Dietitian and Nutritionist Bonnie R, Giller. It was a fun an informative show. Please, listen to our show this evening at 8:00pm (Eastern Time) on BlogTalkRadio.com.